The above info came from Who Wants to Know?, and was edited by yours truly (contact me). The image came from Anime Toxic. Ishikawa Ishikawa "The Laughing Man" "The Laughing Man"
Shinhama, Japan, AD 2030. It's a brand new frontier. Out from the rubble of natural disaster, technology has flourished and reached out in new, unanticipated ways. Such it is that the boundary between what is physical and what is not, living an nonliving, has become very blurry. Even the fundamental essence of life itself is being put into question. And yet, within this highly-charged atmosphere, crime and political intrigue still abound. This is where Public Peace Section 9, a branch of Japan's Ministry of the Interior, comes in. A semi-autonomous special operations unit, they specialize in highly-sensitive political matters and high-tech crimes, especially those that involve the Net, and its team of agents are tasked with taking out these threats to society...though due to the nature of the crimes, sometimes, it may be difficult to determine just what is the exact nature of the threat or what its true motives may be. Complicating the matter is the fact that the merging of physical reality and virtual reality is starting to obscure the once-clear boundaries of society, such that a new world order, one that merges physical and electronic, actual and virtual, is emerging before everyone's eyes. For those familiar with the Ghost in the Shell movie, it should be noted that the TV series is more like an alternate reality than having any solid storyline connection to the original movie. The series subtitle, Stand Alone Complex , comes from the unique structure of the series. Each episode has either a strong tie into an overreaching master plot that pervades the entire season (the Complex episodes) or a lesser tie embedded within an independent episode plot-line (the Stand Alone episodes). In the year 2030, the relation between mankind, technology, and the internet has evolved, making Cybernetic enhancements to human beings commonplace, and forever changing society as we know it. Cyberbrains can be programmed with human-like intellect, leading to a new level of hacker cyber-crime. 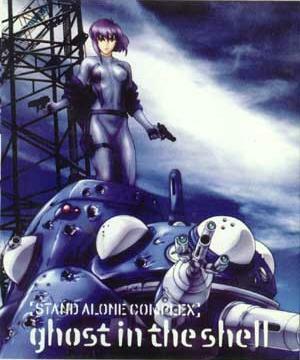 Based on the manga series by Masamune Shirow, Stand Alone Complex focuses on the many cases of the police force "Section 9" led by Major Motoko Kusanagi whose body was replaced by a cybernetic one a long time ago. While they handle many side cases, a strange and long-dormant case involving a mysterious cyber-criminal named "The Laughing Man" continues to haunt Section 9.